What to Expect from a Tarot Card Reading? ​Although there may be many reasons why skeptics would like to dismiss a tarot reading, tarot readings are really helpful when it comes to making predictions for people whose date or timing of birth are not known. Tarot card reading is considered as totally subjective by skeptics and if you are not a good psychic, understanding the tarot messages can be wastage of precious time and energy. Whenever you go for a tarot reading for any reason that may be just curiosity or pain or any other issue, the wise approach is to use tarot card without any fixed beliefs prior to the session. Tarot card reading can actually provide a valuable insight into the past and present events of a person’s life. It can also help to foresee the consequences and outcomes of certain actions and situations. Tarot card is not fortune –telling in complete sense. Whenever you concentrate on a particular question, have you never found that the same card appears over and over again? However, interpreting that card may be different realm altogether. A tarot reading is influenced by even slight changes in the external conditions just like changed weather has its own impact. Change in external forces and shifted conditions leads to various changes in the outcomes of tarot card reading results. This can be simulated to weather forecasting that can undergo abrupt changes. In fact, the greater the distance of the date of prediction and the event for which it is predicted, the more likely would be the impact of factor of inaccuracy. The changing nature of readings with time should thus be analyzed in rational ways by skeptics and messages should be divulged closer to the likely events. Even after a thorough shuffling, with the passage of time, it is quite likely that cards repeat themselves in continued readings. 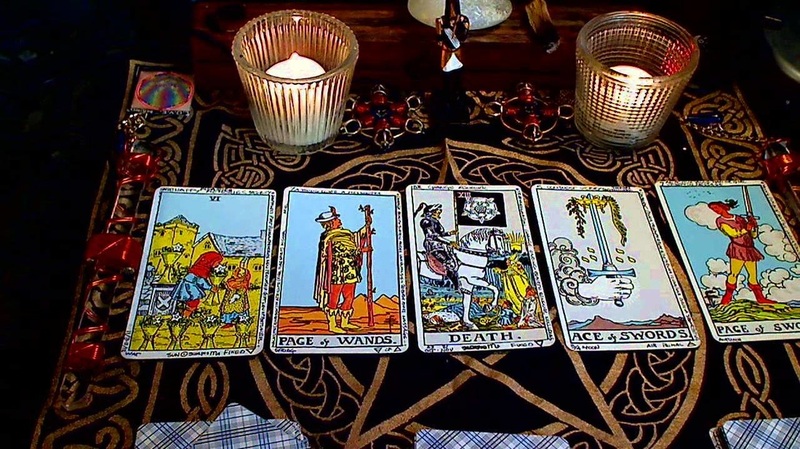 The pattern of a particular set of cards getting repeated in the tarot card readings is observed so often, especially in cases when the inquirer has had a long-term connection with the reader and both are focused on a particular issue without any kind of distraction. With changes in attitudes, perception and actions of the inquirer would influence the patterns of repetition over eh long-term. More probabilities get evolved when changes in mind of the questioner start happening. Just in the way, a musical instrument needs fine-tuning and setting of a base, tarot reading requires the same skill. The placement of the cards in the set would remain same but the perception can change with the timing of the interpretation of the reading, just in the way every musical instrument has its own distinct flavor and tone. Even if your pattern of cards may appear in more or less same way, there would be subtle differences in perception and interpretation in every session. Just like the same composition sung by the same singer, there are certain differences in the performance that is rendered, similarly a tarot reading is different every time. Same reading is never repeated. In case you are looking for a tarot card reading in Sydney from a wise and intuitive fortune-teller, contact us. Visit our website to know more. Spiritual healing is considered as the age-old concept in the eastern world. However, it is relatively newer concept for people residing in the western part of the world. Though, there is a large part of population that does ‘believe’ in the concept of god, but very few have really been able to phenomenally observe that a higher power does exist. These people have worked to increase their spiritual levels through a set of techniques that internalize the focus of mind. In this process, spiritual practitioners also become equipped with the power of spiritual healing. Most of the diseases that manifest in the body arise on the spiritual level. Physicians have labeled 80 percent of the diseases as psychosomatic. In other words, 80 percent diseases have an origin that is related to mind and are spiritual in nature. Diseases of such kind may arise due to past karmas, evil spirits or negative energy. Spiritual healing helps us to become more joyful, peaceful and loving. They also provide inspiration and guidance of divine beings and helps one connect to one’s own inner voice. A spiritual healer is a person who helps one to gain the benefits in an easy way. There are numerous methods that are practiced by healers all over the world for bringing about restoration of health and peace of mind to seekers. The vital ‘pranic’ energy present in the universe, named as ‘Chi’ is used and channeled by a spiritual healer to the afflicted persons. What makes Spiritual Healers Effective? An important pre-requisite for the well-being of both the seeker and spiritual healer is that the healer works without a selfish motive to gain name, fame or money. Due to this, most of the spiritual healers prefer to bestow their healing energy on seekers who want to start and/or progress on the spiritual path and are facing obstructions in the same. Spiritual healers who work with the agenda to heal just for the sake of healing end up becoming used by wrong entities like ghosts. Humility is another vital attribute that should be maintained by a spiritual healer. Healers who tend to be egoistic fall prey to negative energies and lose their healing powers and themselves become engulfed in problems. Thus, spiritual healing is a very sensitive process and requires esoteric approach while following certain ideals. However, spiritual healing is very helpful and can also be practiced for self-healing. It is said, spiritual energy flows spontaneously towards the center where selfless love of a person gets directed to. For example, a child feels comforted, relaxed and free of pain the moment a mother lovingly bestows a concerned touch on the child. The universe responds to selfless love by providing a healing energy. Nowadays, most of people get afflicted by depression, anxiety and so many diseases. This occurs due to reduced spiritual energy of individuals. One can enhance one’s own spiritual level and energy by learning certain techniques from a best spiritual healer in Sydney. Meditation is one of the methods that are helpful in this regard. For learning more about spiritual healing and how it helps you, just click in here. The ancient science of Tantra deals with realms of mind. According to our sages, our mind is subtle form of our gross body. Therefore, mind comes in the realm of metaphysical sciences. As for physical science, the metaphysical science can be used for constructive as well as destructive purposes. However, before misusing any knowledge, one needs to consider the irrefutable law of karma. As per this law, well-intended actions done for achieving good ends are ‘vihit karma’ and bring beneficial results now and in future, whereas, actions done to harm others bring negative fruits to self. Tantra methods were used for achieving progress in spirituality using gross body. However, many people later misused this science for mundane materialistic gains and ended harming themselves and others. This also led to loss of faith in the technique and it began to be perceived as something negative and that is not true. In fact, tantra has given a technique of vashikaran which can be used to beget fruitful results in emotional complications and hurdles. Astrology reading also helps in clear analysis of gravity of underlying problems and suitable remedial solutions can then be formulated by expert. The effect of sound vibrations and frequencies of various kinds on human mind and body is now scientifically documented and proved. While watching a horror movie, the sound effects (special frequencies are used) are the primary way to arouse feelings of fear in the viewers. In ancient times, our sages did deep intuitive researches in invisible realms of mind and discovered various mantras that could modify the state of mind of a person. The Gayatri mantra is carrying highest frequency sounds producing delta waves and is very uplifting. Similarly there are mantras of hypnosis or vashikaran as it is popularly known. When two genuinely compatible individuals find all reasons to spend their lives together and complement each-other through good and bad times, problems related to families can arise. When parents find reason of disagreement due to caste, religion, financial differences or any other problem, young minds delve into hopelessness. In such times, a little external help with vashikaran can build mutual trust and understanding between families. A new bond of love and trust gets formed. On the other hand, in fast –paced world, two people who had shared wonderful times and memories together might just decide to part due to minor differences. Sometimes, there is an unrelenting partner who wastes time in drinking, gambling, violence at home, and vice activities. In such cases, a Vashikaran specialist in Sydney with knowledge of vashikaran and black magic can come to your rescue. The technique helps the other person to become affirmative to your positive thoughts. It thus helps the person return to normal life and love returns to life bringing prosperity and happiness.